The University of Illinois Springfield Computer Science Department accepted a check for $26,592 from State Farm Insurance during a presentation on October 23, 2017 in the Public Affairs Center Atrium. 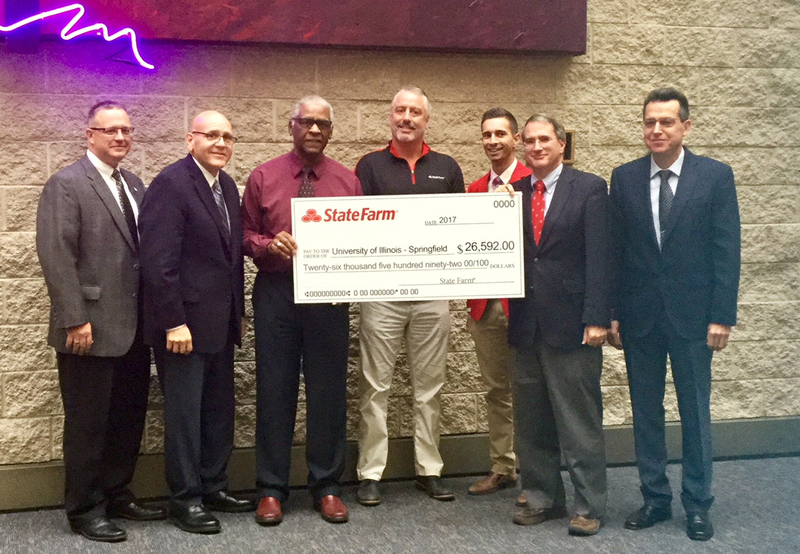 The State Farm Systems Priority Grant will be used to update and increase the capacity of the department’s Virtual Server Farm, which consists of more than 2,200 virtual machines used by students in core and elective computer science classes, both online and on campus. The UIS Computer Science Department teaches 80% of its classes on the Virtual Server Farm, a major technological backbone that enables the department to deliver innovative degrees in computer science, information systems security, and data analytics. More than 1,200 students use the Virtual Server Farm on a daily basis to access personalized virtual machines in every class they take, and work with cutting-edge software from both on and off campus. Virtual classrooms, full of networks of virtual machines, provide students with enhanced learning experiences and allow them to research and explore real-world problems, simulate complex environments and visualize and analyze large amounts of data in innovative courses. “The Computer Science Department at UIS is honored to receive the award, which is crucial to remain cutting-edge and maintain our status as a premier Computer Science Department, thus allowing us to continue our tradition of academic excellence,” said Associate Professor Sviatoslav Braynov, head of the Computer Science department.